President Moon Jae-in's approval rating has fallen below 50 percent level for the first time since he took office. Gallup Korea last Friday said the biggest factors behind the decline were economic woes, including the minimum wage hike, job shortage, and real estate market volatility, which soured public opinion. 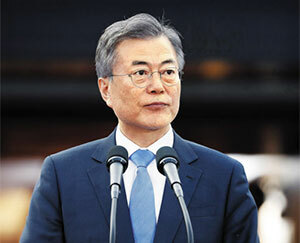 Cheong Wa Dae spokesman Kim Eui-kyeom said the president "solemnly accepts the situation and has vowed to listen more closely to the views of the public." The proportion of people who feel that Moon is doing a good job fell from 53 percent in the first week of September to 49 percent, while that of those who feel he is doing a bad job rose from 38 to 42 percent. The difference has narrowed to less than 10 percent. Moon's approval rating soared to 83 percent shortly after his first summit with North Korean leader Kim Jong-un in May, but has plummeted 34 percent percentage points in four months. That means four out of every 10 of Moon's supporters turned their back on him. Those who no longer favor the president are mostly the self-employed and low-income earners. Some 59 percent of small-business owners disapprove of Moon while only 32 percent supported him, while only 39 percent of low-income earners back the president, the lowest level among all wage groups. That means the very class Moon sought to protect with his economic policies has largely abandoned him. 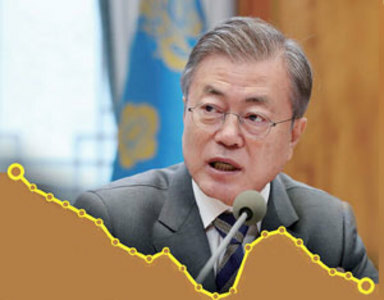 Economic policy mistakes were the main culprits for Moon's declining approval rating. Some 41 percent of respondents said they did not approve of handling of economic affairs, while seven percent cited the minimum-wage hike, six percent his real estate policy, six percent failure to create jobs and four percent his excessively generous welfare policies. Pollsters said former presidents all saw their approval ratings fall below 50 percent two years into their administration and were unable to recover. "There's a chance of Moon's approval rating rising temporarily after the third inter-Korean summit, but he needs to create an environment for economic recovery while stimulating the job market," one said. The latest survey was conducted among 1,000 adults across the nation.